Building on the previous post I created to reveal some misconceptions of how NFS traffic is routed on vSphere, this article will be a technical deep dive on same subnet storage traffic. The information presented here is mainly focused on how NFS traffic behaves, but can also apply to iSCSI traffic when vmkernel bindings are not created. If you are using iSCSI with vmkernel port bindings, subnet rules do not apply to storage traffic. To demonstrate the way that vSphere routes NFS traffic on a single subnet, I’ve created a lab using 2 NFS servers (NetApp Simulators) presenting 2 exports each, for a total of 4 exports. All traffic is on VLAN 5 (which is 10.0.5.0/24 in my lab) to an ESXi host running 5.0 update 1 (build 623860). The host has 2 uplinks along with 4 vmkernels, giving the NFS traffic a lot of options. In order to consistently create traffic, I have deployed 4 of the VMware IO analyzer appliances – one on each export. This allows me to quickly simulate VM traffic going to all of the exports at the same time. 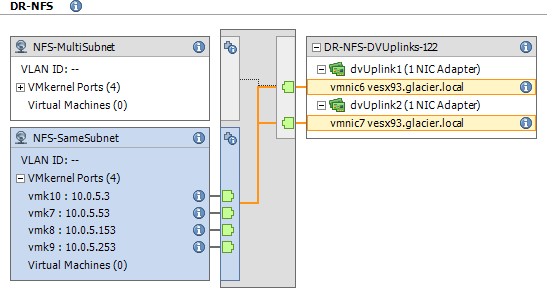 A look at the vDS showing the 4 vmkernels mapped to 2 uplinks. All vmkernels are in the VLAN 5 subnet. No other vmkernel is on VLAN 5; it is a completely isolated subnet. Next, a picture of the NFS datastores. 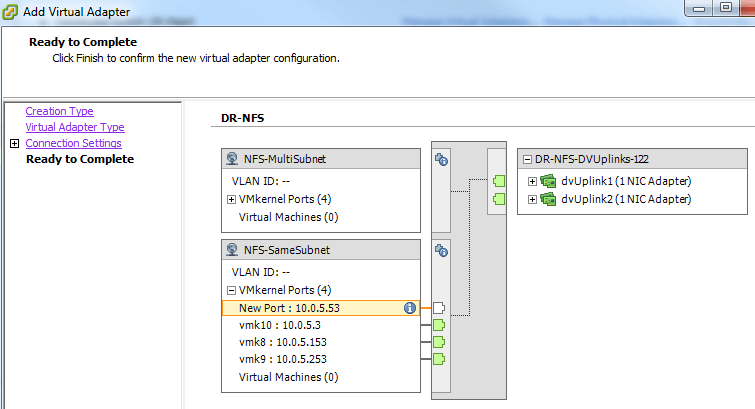 Note that each datastore is mapped on VLAN 5 to the pair of NetApp Simulators. Mapping was done using a simple PowerShell script. For the first test, I simply crank up the IO Analyzers and watch ESXTOP. All analyzers were powered on at the same time and storage was presented just prior to loading the analyzers, giving the datastores an opportunity to choose any of the 4 vmkernels on VLAN 5. The following screenshot shows the configuration of IO Analyzer for my 4 appliances. The IP addresses for each appliance reflect the management IP address and has no relationship to the subnet used for NFS storage. All NFS traffic chose vmk7, which is using vmnic6. The receive numbers tend to confuse ESXTOP because a virtual ESXi server requires a promiscuous port to operate, and so there are many duplicate frames being received on the other uplinks. Regardless, vmk7 is clearly transmitting the read requests (12,711.04 in this photo). This test verifies a number of things. vmk7 is the lowest vmkernel number and first vmkernel available in the team (vmk8, vmk9, and vmk10 are the other members). vmk10 has the lowest IP (10.0.5.3), debunking any thoughts that the IP address is relevant to uplink selection. The host doesn’t seem to care about IP address for selection. NFS Datastores do not look at “randomly” picking a vmkernel when they are created, but instead seem to pick the first vmkernel on the list. This doesn’t necessarily mean the lowest number, but typically when creating vmkernels they follow an incremental number pattern (7, then 8, then 9, and so on). For this test, I am going to run the same IO Analyzer simulation, but then remove the active vmkernel (vmk7), let traffic migrate to another vmkernel, and add vmk7 back into the team. This test will verify if vmk7 is actively sought out, or if a migration of the datastores to another vmkernel is permanent until another failure. First, traffic is simulated and vmkernel 7 (vmk7) is removed. The host moves traffic over to vmk8. Note below that vmk7 no longer exists. I then re-added vmk7 back into the team. Traffic remains on vmk8. I’ve highlighted vmk7 and vmk8 below. I’m not going to fill this post with pictures, but I also removed vmk8 and saw traffic move to vmk9. Removing vmk9 moved traffic to vmk10, and then removing vmk10 put the traffic back on the original vmk7. The next vmkernel port on the list is chosen in the event of vmkernel removal. This test reinforces the idea that the list order is how selection is determined, not the vmkernel number. Notice that vmk7 appears at the bottom of the list after being removed and added, but was not chosen again until all other vmkernels were removed. 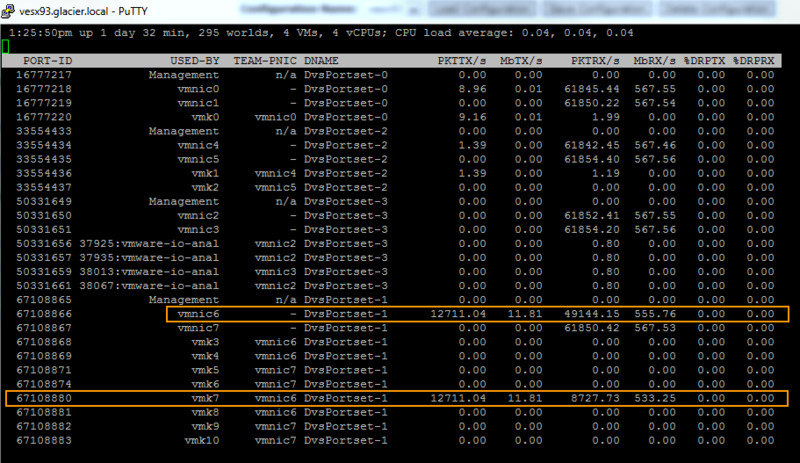 Adding a vmkernel with a lower number to the list does not seem to influence the next vmkernel choice for NFS traffic. 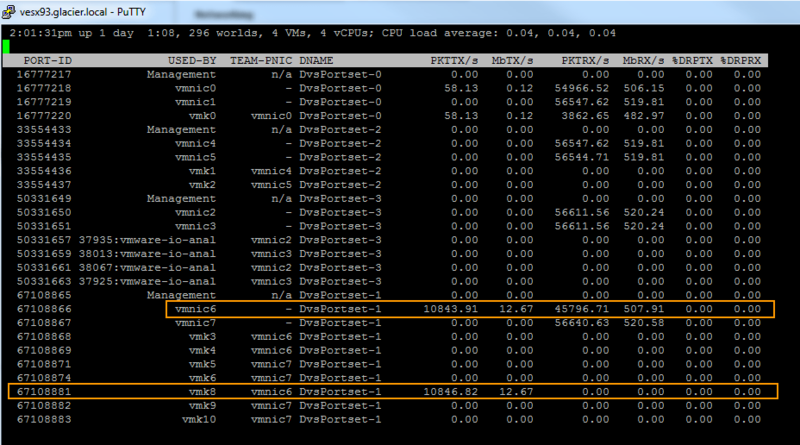 Additionally, I unplugged the uplink and saw that the vmkernel simply moved over to the other available uplink. I hope this clears up some confusion on same subnet vmkernel selection for NFS storage (and unbound iSCSI storage). The main takeaway here is that using a single subnet has no chance of load balancing NFS storage traffic in a default configuration. If you’re using EtherChannel on a single subnet, the best you can hope for is a single vmkernel on the host and multiple IPs on the storage target, in which the switch’s Load Distribution policy will do an IP hash. But, you will need a different target for each uplink with a unique least significant bit (or bits, depending on uplink count). This means that if you have 2 uplinks, you’ll need 2 storage targets. Subsequently, 4 uplinks will require 4 storage targets. Using multiple vmkernel ports on the same subnet will have no influence on your EtherChannel Load Distribution because the host will only pick a single vmkernel to route traffic! Thanks for all the time and effort you put into these posts. Your explanations go a long way. What kind of switch are you using in your lab? Two subnets / vmkernels isn’t required unless you want to load balance and are not using EtherChannel. It’s all just layer 3 routing – the hypervisor selects a route out of a single vmkernel, the vmkernel transmits out of a single uplink, and the packets make through the network to the storage. I’ll have a multiple subnet article out “soon” which will go into the design and technical details. Great post, I have been seeing that same behavior of NFS using a single vmkernel of a single host and thinking something was really wrong (still have a case with VMWare open). I’m not understanding correctly if there’s an alternative for my case. I have multiple hosts, multiple vnics for storage per host, but no link aggregation/etherchannel, what should I do to distribute the load among either different vmnics or different hosts? See if my multiple subnet post helps answer that question. I cannot agree more with your conclusion and this is something that most NAS vendor do a very poor job at explaining. The key to have “true” load balance with NFS is multiple subnet…(your next post) Here is what I found out/understand at this time. Maybe you will validate/debunk in your lab. Here are the requirements for proper loadbalaning using NAS. To understand the IP hash I created an excel spreadsheet to understand the impact of the IP you choose. This is for a 4 uplinks model. This important as the last part of the algo is a modulo#uplinks which gives you the uplink that will be used. Don’t get me wrong… I love NFS, it is our production standard. But load balancing is not automated and requires some serious thought. Thanks for the great article Chris, trying to wrap my head around this stuff is already difficult enough your articles help a lot..! But when I look at your first diagram, vmk7 is shown to be connected to vmnic7 instead of vmnic6 am I correct..? I really like your blog, keep cranking out these great articles..! Later, after removing and then adding vmk7, the host decided to put it on vmnic7. http://wahlnetwork.files.wordpress.com/2012/04/nfs-lab-config.png?w=650. (the blue bubble connecting vmk7 to vmnic7) I would assume that your esxtop picture is leading because it shows the actual traffic. Ah, gotcha, good catch. That’s a tough one to draw out, as the host itself actually picks the uplinks for each vmknic when it is powered on. The logical config you reference was correct when I first powered on the host, but subsequent reboots and breaking the switch caused the vmk to jump around a bit. Edit: Basically, trust the esxtop images, as they were “real time” during the tests. What would happen if you had the vmkernel in the management network and then a seperate vmkernel created in the same subnet? I would think that the vmkernel from the management network would be the lowest number since its created with the host and therefore all traffice would route over that vmkernel which is not desirable. 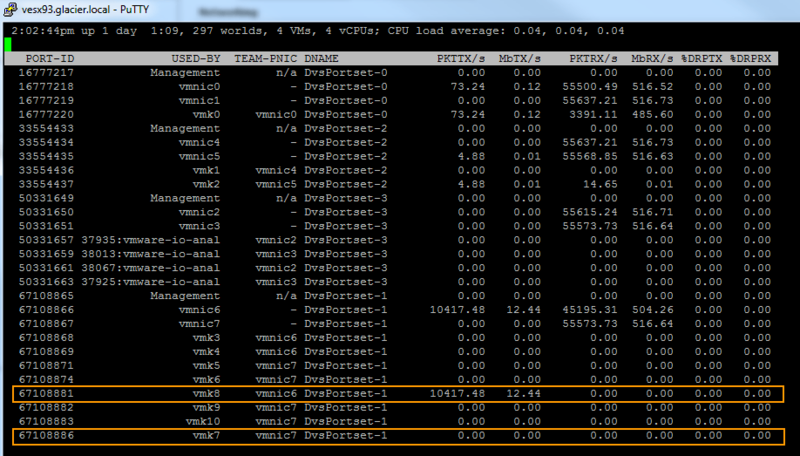 Or does any vmkernel that has the management traffic checked get bypassed if there is more than one vmkernel? I think in that case it would be whatever route comes up first in the ESXi routing list (esxcfg-route -l), which would most likely be the management vmkernel port. From what I’ve observed, NFS traffic does not check to see if the vmkernel port it is using has management enabled, and I have encountered environments where NFS was traversing over the management vmkernel in this situation. Note: iSCSI traffic does have an exception. When you bind an iSCSI vmkernel to an uplink – even using the same subnet as management – iSCSI traffic will use only the bound vmkernel ports. 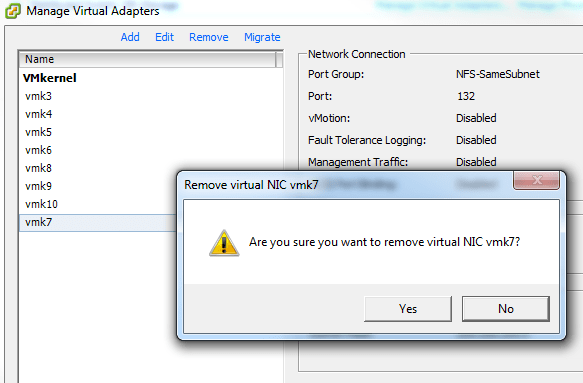 So basically there is no way to ensure that you do not send the traffic over vmkernel on the managament network if your storage is on the same network while using NFS even if the vmkernel? 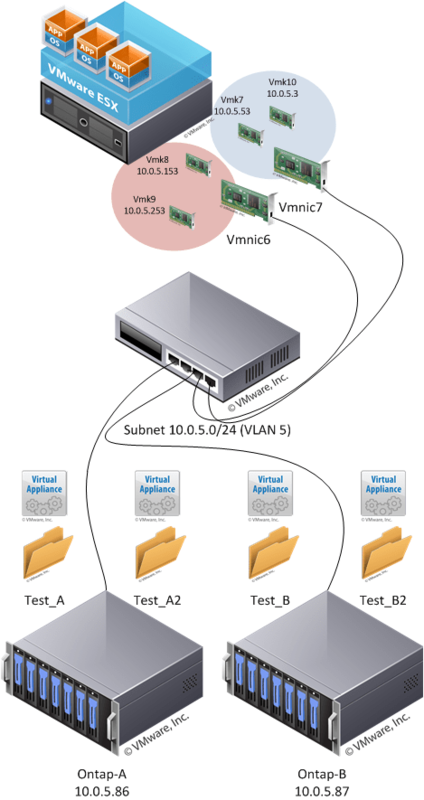 What about seperate vSwitch with seperate nics on the same subnet? The only option would be to create a seperate subnet and put your storage on that? The only method to ensure NFS traffic goes out of a specific vmkernel is to use a unique subnet.